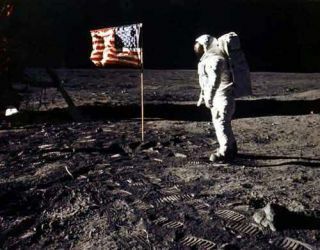 In one of the many iconic photos from the Apollo 11 mission of July 1969, Buzz Aldrin, the second man to step foot on the moon, is pictured standing by the American flag. In all, six of NASA's Apollo missions landed astronauts on the moon between 1969 and 1972. Apollo 11 astronaut Buzz Aldrin, the second man ever to walkon the moon, is suing the trading card giant Topps for using a photo of himtaken on his historic moonwalk as part of a recent series of collectable cards,according to news reports. After being unable to negotiate a licensing fee for theimage, the 80-year old Aldrin filed a lawsuit against Topps in a Los Angelesfederal court on Monday (Dec. 27), "contending that the trading cardcompany had unjustly profited from his historic achievement by including aphotograph of the Apollo11 mission in a series of trading cards," according to a LosAngeles Times report.? The NASA image in question appears in Topps' "AmericanHeroes" series of collector cards, which was released in 2009. Michael Kahn, the attorney representing Topps, claims thecompany's right to include Aldrin's image in the historicevent falls under the First Amendment. "Topps included Dr. Aldrin within the 'American Heroes'edition because it believes he is an American hero and is thus proud to be ableto share such information with its audience," Kahn wrote in a letter datedApril 15 to Aldrin's law firm. Aldrin became the second man to step footon the moon on July 20, 1969, when he and Apollo 11 mission commander NeilArmstrong landed their craft, called Eagle, on lunar surface to make the firstmanned moon landing. Their third Apollo 11 crewmate, Michael Collins remainedin orbit aboard the mission's command module Columbia. Since then, he has carefully protected his image andintellectual property rights. In this case, Aldrin argues that the use of hisimage is adding value to a commercial product. Aldrin's lawyers have issued a warning to Topps that theyhave successfully helped the astronaut obtain more than $760,000 in legalsettlements from other companies that have used his image on books, softwarepackaging and trading cards, the L.A. Times reported. But Aldrin's team may have some hurdles ahead. "NASA's position is that while the photographs taken onthe moon, in space, and elsewhere during the astronauts' careers with the spaceagency are public domain ? meaning no copyright is asserted ? if the images areused for commercial purposes, permission should first be sought from theperson(s) depicted," explained Robert Pearlman, editorof collectSPACE.com, an online publication and community for space historyand artifact enthusiasts, and a SPACE.com contributor. Aldrin is not the only astronaut to fight back againstimages used without permission. "Neil Armstrong brought legal proceedings againstHallmark for their ornament's use of his name and voice. That case was settledout of court for an unspecified amount," Pearlman told SPACE.com. "Thelate Pete Conrad and Jim Irwin (and their respective families) have defendedtheir right to license their likeness for action figures and other commercialproducts." More recently, astronaut Bruce McCandless sued pop singerDido for using a photo of him during a spacewalk on the cover of an album. Thecase is still pending in court. And while a decision in Aldrin's case remains to be seen,the case represents the difficult line between public and private property ? andthe related consequences. "I don't know what direction Aldrin's case againstTopps will ultimately take," Pearlman said. "While I appreciateAldrin's rights ? as afforded by the law ? to protect his image, I cannot helpbut also think that this could dissuade Topps and other trading card companiesfrom producing astronaut and space-themed products, which would be unfortunate.Dating back to the 1960s, space trading cards have been a great way to engagekids in learning about space history." You canfollow SPACE.com Staff Writer Denise Chow on Twitter @denisechow.